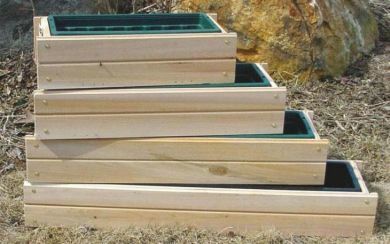 Our wooden window boxes are hand constructed from rot-resistant Northern White Cedar. Choose from Plastic Lined, Scalloped, or Plain Front in sizes from 18″ to 36.” All of these options include a cleat hanger mechanism for easy installation, except for the plastic lined 550 Series. 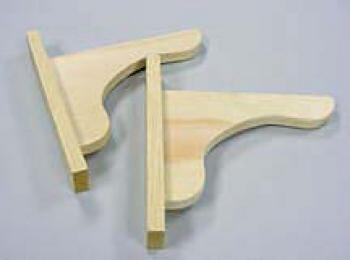 For that style, we offer the H550 wooden brackets, which are sold separately. The Maine Bucket Company is always pleased to offer top quality wooden products. The Northern White Cedar used in the construction is naturally rot resistant, which assists with product longevity. We will say that the life of these products does depend a great deal on the manner of care and exposure to weather elements. In time, these planters will age gracefully to a silver gray – unless you opt to stain your purchase in one of our 17 color options. We obviously advise, whether you are selling these items in your retail spaces or using them for in-store displays, even though Northern White Cedar is rot-resistant it is not exempt from rot. If you take care, as with any of your resale items or displays, you will receive a longer quality of life from the product. 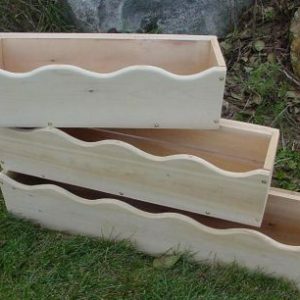 If you would like to add these planters to your resale inventory, bulk sale is available. We often build window boxes in larger quantities as we head into spring on the East Coast, so if you need a large number just call us around December to place your bulk order. If you have any questions or need more information please contact us today!